Congratulations to the award winners of 2016! From left, George Kamper, Dan Grant, Rev. Tom Henion, Lt. Carlo Marucci, Ryan McDermott, Annabel Pierce, Aran McDermott, Vivian Cleffi, Anthony Sia. Read more about Meet our 2016 Awardees! Vivian Cleffi has been a member of UNICO National, Montville Chapter since 1997. She currently serves as Chair of the Charitable Goals Committee, which oversees a budget in excess of $50,000 to fund the Chapter’s various charitable works. Vivian brings her limitless energy into a very demanding position in the Chapter. Vivian was blessed with three children ­– Jim Jr., Vincent, and Jason. In 1975, Jim Jr., at the age of eight, was diagnosed with a rare form of leukemia, and lost his battle with the deadly disease a year later. Vivian realized there were 32 cases of a rare form of cancer in a small geographical area and blew the whistle, creating a firestorm, which was covered by radio, television, and print media. Vivian, along with other concerned parents, created a group called We Who Care and fought the state to remediate the toxic causes of the cancer in the area known as Cancer Alley. Vivian has lectured at more than 140 colleges, imparting her experience and wisdom in career development for students. She worked with the N.J. Department of Labor and the National Association of Trade and Technical Schools, and became president of Adults and Children with Learning Disabilities, lending her expertise to that endeavor. Ryan McDermott and Aran McDermott, brothers and owners of Harrigan’s and Columbia Inn, are true hometown boys. They went to William Mason, Lazar Middle School, and graduated from Montville Township High School. Ryan lives in Towaco with his wife, Cheryl, and twin daughters, Reese and Riley. Aran lives in Montville with his daughter, Genevieve. The McDermotts are celebrating three anniversaries this year, giving a deeper significance to the meaning of this award. Their grandfather, Jack McDermott, emigrated from Ireland to America exactly 100 years ago, and spent his very first night in Towaco, at his sister’s home on Bott Lane. Years later, Jack’s son, Joseph, and his wife, Wallis, returned to Bott Lane where they built their first home and raised their two boys, Ryan and Aran. Harrigan’s is celebrating its 35th anniversary. This family restaurant was once an old dive bar called Jerry’s Tavern, known as a biker’s hangout. Joseph McDermott used to say there was no place in Montville to get a good burger, and decided to change that. In 1982, he bought Jerry’s and transformed it into the warm, inviting Irish pub often described as the Cheers of Montville, where everybody knows your name. Columbia Inn is celebrating its 20th anniversary. When Ryan McDermott was 27, he joined his father’s restaurant business, and they purchased Columbia Inn in 1996. It was a vacant building with boarded up windows and a dirt parking lot. They faced a very tough challenge, but managed to open seven months later, in 1997. Columbia Inn has become well-known for its fine cuisine, attentive service, and delicious thin crust pizza. Aran joined the business in 2004. Joseph, passed away in 2010. Wallis now splits her time between Montville and Hobe Sound, Florida. The brothers run the business with the values instilled in them by their parents. Their priority has always been to support Montville through contributions to the local sports and school activities, events, and fundraisers that come their way. Boy Scout Troop 74 has served the Montville area since 1942, when its charter was issued to the Montville Reformed Church. The Troop has approximately 75 registered Scouts and 25 Adult Leaders, making it one of the largest Troops in its District. The Boy Scouts of America upholds the principles of service, community engagement, and leadership development of our community’s youth. It is a values-based youth development organization, providing programs for young people that build character, train them in the responsibilities of participating citizenship, and develop personal fitness. The Boy Scouts of Troop 74 regularly donate their time in service to our community. Individual Scouts organize service projects in order to fulfill their requirements for the rank of Eagle Scout. In the past five years, 42 Scouts advanced to the rank of Eagle Scout, producing service projects for organizations that benefit our community. These projects, along with other ancillary Troop activities, resulted in 5,563 hours of community service and over $33,000 raised for these projects. The key Adult Leaders in the Troop are Charter Executive Rev. Thomas Henion, Committee Chairman George Kamper, and Scoutmaster Patrick Phalen. There are an additional 22 Adult Leaders that are invaluable to the success of Troop 74. 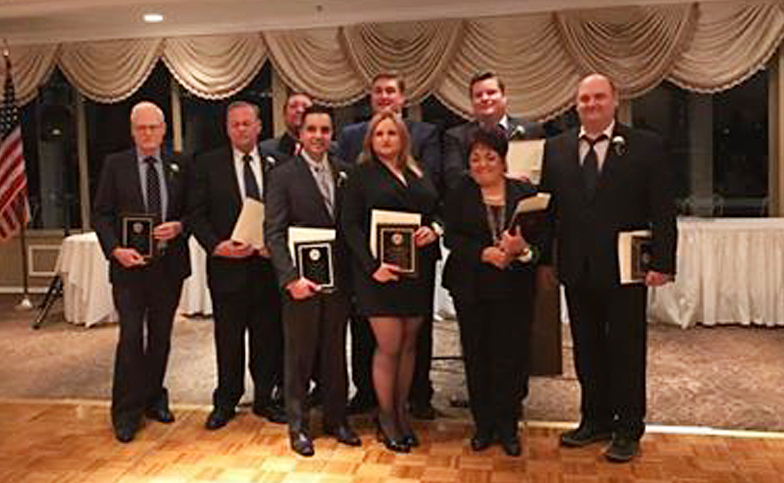 Receiving the Organization of the Year award is a befitting testament to the Scouts and Adult Leaders of Troop 74 as the Troop celebrates its 75th anniversary in service to the community of Montville. Lt. Carlo Marucci is a life-long resident of Montville Township. He lives in Montville with his wife, Kristen, and their sons, Giancarlo, 8, and Gianni, 6. Marucci graduated from Montville Township High School and pursued his career in criminal justice at County College of Morris and William Paterson University. In 2001, Marucci was hired as a Patrolman by the Montville Township Police Department. In 2012, he was promoted to the rank of Sergeant, and in 2015, to Lieutenant, where he remains the Shift Commander of Squad One within the patrol division. He also serves as the Head Firearms Instructor, which oversees the firearms program for the department, and Field Training Officer for the new patrolmen. During his career, Marucci has received five Honorable Service Awards, two Unit Citations Awards, and two Life Saving Awards. He was also the recipient of the Chamber of Commerce Public Safety Award in 2011. Between January and September 2016, Marucci arrested 14 people for possession of Heroin, resulting in the seizure of over 571 bags of Heroin. He works hand in hand with his officers, and always provides assistance to them when needed, giving them guidance, direction, and instructions. He leads by example and has brought pride and distinction to the Montville Township Police Department. Anthony Sia teaches computer technology at Montville Township High School. However, music has always played an important role in his life. His mother introduced him to the Beatles, and his father had a job setting up sound systems for some of the most famous bands of the ’60s. Growing up, Sia played the trumpet in the school band, and by the time he got to high school, he had his own band. His dad built amplifiers, which made an incredible difference in their sound. Almost 30 years later those amplifiers still worked, and Mr. Sia used them to start the Montville School of Rock – an organization that combines classically trained and self-taught student musicians to form a Rock n Roll band. For the last 11 years the group has been donating the proceeds from its concerts to worthy causes. Whenever possible, students meet with the recipients of the funds they raise, so they can realize the difference they’ve made. The impact is profound and empowering – especially for teenagers. The group, which now has new equipment that was donated by the Montville Education Foundation and Montville’s Parent Teacher Council, raises thousands of dollars each year for organizations such as Montville’s Drug Awareness Council, The Homeless Bus, GirlUp, Emma’s Angels, and Eleventh Hour, just to name a few. The School of Rock will be performing in the high school auditorium on March 16 to raise money for the Montville Education Foundation, and on April 21, for the Gloria Foundation. Jupiter Environmental Services is a construction service company that provides asbestos abatement, demolition, insulation and lead paint removal for homes, businesses and public institutions throughout New Jersey and New York State. Annabel Pierce is president of the company, which has offices in Pine Brook, Albany, and Rochester. Their headquarters at 323 Changebridge Rd. was once old manufacturing building that had been vacant and neglected for years. Jupiter purchased the property in February 2011 and began a lengthy process of acquiring N.J. Department of Environmental Protection permits and planning and zoning board approvals to improve and repurpose the building and the property. The remodeling process included complete exterior and interior building improvements, a construction yard, landscaping, streetscape lighting, and a sidewalk. Dan Grant is a life-long Montville Township resident. Community service has always been part of his family life. His grandfather moved to a farm in Montville in 1917. His father was a Cub Scout leader, coach, and co-president of the PTA. His mother was Den mother, active in her church, and a co-founder of the Montville Township Women’s Club. It naturally followed that as Grant raised his family here, he would be involved in the community. Grant’s current activities include Vice Chair of the Historic Preservation Review Commission, and Director of the Changing Images Art Foundation, a non-profit involved in providing interactive art for people in hospitals and institutions. He also serves as Democratic Municipal Chair and member of the Morris County Democratic Committee. Grant’s proudest achievements include working with others on the Township Committee to obtain the large amount of open space that Montville Township enjoys, and expanding recreational opportunities for all our children as the Township grew. His most enjoyable times were spent coaching Little League and Girls’ Softball, and teaching Sunday School. Grant has served 15 years as an elected official and member of assorted committees in conjunction with that role. He volunteered for 10 years on the Planning Board. He served on the governing body of his Church, taught adult Christian Education, and was a former Deacon and Elder.